The French orientalist Jacques Berque (1910-1995) was known for his being a friend to sheikhs and clergymen of Al-Azhar, and he translated the Quran into French (Le Coran : essai de traduction) and authored a book titled "Rereading the Quran" (Relire le Coran). In this book, he suggests that the Quranic verses should be reordered as per the supposed chronological order of their revelation (maintained by Al-Azhar), instead of keeping the current order of verses and chapters. Furthermore, he repeats in his book the same nonsense of ancient Sunnite books that the so-called companions wrote Quranic verses in scattered parchments within the supervision and presence of Muhammad, who is assumed by Sunnites to have been an illiterate person! No Azharite friends of Berque refuted his views about rearranging Quranic verses. When the Egyptian translator Dr. Wael Ghaly Choukry translated into Arabic "Rereading the Quran" (Relire le Coran), the publishers asked our person to write an introduction to analyze and refute views of Berque, and we did so voluntarily while asking for no remuneration at all in our defense of the Quran/Islam. Within our introduction, we have proven that Muhammad was a literate person and he wrote the Quran in that order himself, within divine guidance, and never an illiterate man as Sunnite scholars assume in their books to justify the assumed importance to the so-called 'companions' who are Sunnite deities now. Such Sunnite falsehoods are the bases of the views of Berque and of all views of haters of the Quran who desire to undermine and cast doubt on it. Such undermining began by Sunnite scholars of the Middle-Ages (e.g., Al-Baqlany and Al-Siyouti) who established the so-called Quranic branches of sciences that twist and distort meanings of Quranic verses. Such Sunnite books are filled with myths that lead readers to doubt the Quran. All these myths are based on the one big lie of assuming that Muhammad was illiterate and his 'companions' wrote down the Quranic verses. Thus, Berque assumes in his book that the Quranic verses are written in a random order and they should be rearranged thematically or as per the chronological order of revelation. Our introduction that precedes the translation of the book was published by the Cairo-based Dar Al-Nadeem Publishers in the mid-1990s. Within the Cairo-based Al-Ahram Al-Misaa'e newspaper, the journalist and writer Hussein Jubayl praised our views in that introduction and our proofs that Muhammad was a literate man who wrote the Quran himself in that order. Yet, no one else commented on that issue for a while, until the Cairo-based leftist magazine Rose Al-Youssef re-published the story regarding that issue along with our views and introduction. Debates and hot arguments ensued, and the intellectual battle grew bigger in Rose Al-Youssef and within other right-wing, conservative newspapers (mostly owned by the terrorist MB and other Wahabi extremists). The Azharite head of Al-Azhar Observer or Academy of Research, the extremist sheikh Sayed Askar Ameen, wrote an article criticizing our person, decaling us as an apostate and an infidel! Other Azharite clergymen did the same; we disregarded them until people at Rose Al-Youssef requested that we reply and refute their views and accusations. This magazine at the time was a pioneer in freedom of speech as it was led by the free writers and thinkers of the leftist wing like Adel Hammouda and Ibrahim Eissa, and its editor-in-chef Muhammad Al-Tohamy. We began to write occasionally in Rose Al-Youssef, bearing in mind that this liberal magazine aimed at the time at enlightenment and would not accept to publish some of our 'radical' views of religious reform. We did not want to cause any sort of embarrassment of people writing in that great magazine. At the time, this magazines was respected and so popular in Cairo and all issues it raised influenced the public opinion for a long time. By the end of 1990s, Rose Al-Youssef received fatal blows to make it a 'domesticated' outlet that would only praise the Mubarak regime; its leftist great writers were fired and the magazine was no longer filled with freedom fighters, and its new editor-in-chief was a man loyal to the Mubarak regime at the time, and the distribution of the magazine went down. When we were contacted by the magazine to deliver a summary of our introduction of the translated book of Berque, it was published in issue No. 3567, on 21st of October, 1996, within three pages: 74, and 75, and 76. (...In 1971, Al-Hilal magazine published a study by Dr. Ahmed Hussein Al-Sawy about changing the Arabic writing style of the Quran as per modern spelling of Arabic of the 20th century, and our editors in Rose Al-Youssef requested from the Azharite scholar, Dr. Ahmed Subhy Mansour, who was a professor at Al-Azhar University in the 1980s, to give us his views on that topic, but he delivered a bombshell that shook our deep-rooted notions: Prophet Muhammad was a literate man who wrote the Quran himself in that order and in that spelling, within divine guidance, and he says he has proofs of these views. We publish his views here to open the issue for debate...). We re-publish our article here followed by what occurred after it was published. (Title: Was Prophet Muhammad literate? By Dr. A. S. Mansour. 1- Dr. Abdel-Razak Nofal has begun tackle to tackle this new field of study in his book titled "Numerical Miracles in the Quran", and his book revolves around the repetition pattern of some Quranic terms and words; e.g., the terms (worldly life) and its opposite (the Hereafter) are each mentioned 115 times exactly. 2- Within using the computer, the late Egyptian-American Dr. Rashad Khalifa (murdered inside his mosque in Arizona, in 1990) has discovered the miraculous pattern of the number 19 in the letters and words of the Quranic text, within intricate and complex relations between numbers and letters. Sadly, his amazing discoveries influenced his mental state and he declared himself as a prophet, and he was murdered by extremists. We have personally met him for some time as we traveled to the USA several times, and we have witnessed partially his lifetime story. 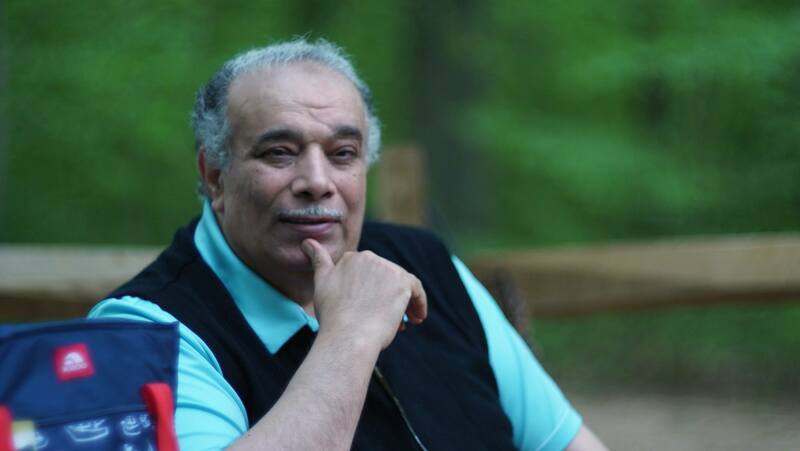 3- The Egyptian-Canadian Mr. Muhammad Mustapha Sadek has continued studies of the numerical miracles of the Quran revolving around the number (seven), and he has reached wonderful conclusions within the relation between numbers and letters of the Quranic words. Our article ends here, but it caused hot debates within Wahabi extremists' magazines and newspapers in Cairo, whether party-owned or State-owned ones. Even in mosques, everybody seemed so keen on declaring our person as an infidel/apostate and attacking us as part of a 'western' conspiracy to undermine the Quran! such accusations were leveled against us by such crazy people; in fact, when both fanaticism and extremism control one's mind, this mind does NOT work properly at all. No one of our attackers asked himself or thought for a minute about who the one really defending the Quran: ourselves with our above article, or those ignoramuses with their demagogy, screaming, ignorance, and bovine stupidity derived from the local influence of traditional books. As typical of us at the time, we did not care to refute any of the accusations and attacks; even in cases when we had written an article in our defense, no one dared to publish it within any newspaper. Strangely, Al-Wafd newspaper (with its editor-in-chief at the time Gamal Badawi) has published at the time a refutation in response of our unpublished article sent by us to defend our stance! Within another instance, our friend, the leftist writer Mr. Adel Hammouda, phoned us one night to tell us about an article attacking and 'refuting' us by a dean of an Azharite faculty outside Cairo. Mr. Hammouda told us to read this article before it gets published so that we would write a response that should be published on the same page next day. Indeed, we sent our eldest son hurriedly to get us a copy of the article of the dean (from Mr. Hammouda in Rose Al-Youssef) so that we would read it first, and we spent the rest of the night to write a response that was ready before Mr. Hammouda in the early morning. Indeed, Mr. Hammouda had published the article of the dean and our article in response to him within five pages. Within the opposite page, there was another article attacking us with verbal abuse and slander that we ignored and decided not to respond to it as the best choice to punish its unknown author who was a nobody that needed to be taught a lesson by being ignored by us; this is our way to penalize such nobodies: we ignore them totally. We note here that Mr. Hammouda has given us the whole article of the dean, whose name was Dr. M. Gabal, but we noticed that they have omitted some lines of it when it got published, for lack of space. But our article was published in its entirety, which included refutation of some of the dean's views omitted from his published article. This was in the issue of Rose Al-Youssef Magazine no. 3571, on 18th of November, 1996, within pages 54, 55, 56, 57, and 58. (Titles: The Response of Dr. Ahmed Subhy Mansour: Ancient Interpretations Have Nothing to Do with the Quran: The Quran Is above all such Books: The Prophet was a Literate Man and he Wrote down the Quran: All Books of Heritage and Traditions Are Filled with Discrepancies and Those Who Quote them Contradict Themselves: Did Muhammad Say that he Left to us Only One Book of Guidance? In fact, reactions to our article about the literacy of Muhammad (and the fact that we infer from the Quran that he himself wrote down the Quranic text in that order shortly before he died) reminded us compellingly with the hot debate that occurred in Andalusia when the fiqh scholar Abou Al-Waleed Al-Bajy (403 – 474 A.H.) wrote that Muhammad was a literate man, and the extremist fiqh scholar Abou Bakr Ibn Al-Saa'egh declared him an infidel and an apostate who insulted the Prophet! All imams of mosques of Andalusia began to declared Al-Bajy as a cursed heretic, and some poets at the time ridiculed and mocked him in lines of poetry. It seems that history repeats itself; a former dean is leveling accusations against us as though we were an ignoramus who never read or studies all Arab history books and linguistic studies. Nothing could be further from the truth; this writer is alluding to us as if we were fabricating stories of our own imagination and that we were betraying readers who know nothing about branches of 'knowledge' taught at Al-Azhar University. This writer is accusing us of fabricating tales to deceive readers! We rarely reply and respond to our denigrators and detractors, but this is a chance to show that our views are ours and they are based on our methodology of understanding the Quran, which differs from Sunnite extremists' methods and ways of depending on ancient, obsolete books of imams who died centuries ago. Our research methodology in tacking the Quran is to read it directly using its own terming without prior notions or prejudices. Of course, we have studied most – if not all – heritage and traditional books and we are fully aware of their little benefits and their countless faults, discrepancies, and contradictions. Indeed, the methods/ways of Azharite scholars in tackling the Quran are faulty as they depend SOLELY on such books even if they contain notions that contradict the Quranic verses, logic, and common sense. If they would like to be fair, they must acknowledge the fact that the Only Book without faults or contradictions is the Quran: God's Word: "...A Book whose Verses were perfected, then elaborated, from One who is Wise and Informed." (11:1); "Falsehood cannot approach it, from before it or behind it. It is a revelation from One Wise and Praiseworthy." (42:41). Any books authored by men/women must contain a measure of error inevitably; yet, Azharite Sunnites assume that ancient imams are infallible in all their views! Their views insult the Quran and accuse it of being lacking or convoluted. Thus, we cannot use man-made books to understand the Quran; rather, we must analyze its terminology and use our mind to understand and ponder it. All heritage and tradition books are bottomless and shoreless ocean of discrepancies and contradictions; most Azharite students have read ad infinitum ad nauseam in Azharite books the phrase: (scholars held different views of that topic...). This means that nothing is ever resolved on by ancient Sunnite imams made holy now by some people! This former dean has mentioned in his article that we must rely on lexicons and Arabic dictionaries to understand the Quran; this is wrong because how come that compilations of Arabic terms in lexicons authored during the Abbasid Era be tools to judge the Quran revealed more than 250 years ago before such lexicons were authored and complied?! The former dean is an expert in linguistics and he knows quite well that languages change with the passage of time phonetically and on both the syntactic (i.e., grammar) and the semantic (i.e., meaning) levels. Thus, we do not need dictionaries to understand the Quran, nor the silly nonsense on books of interpretations filled with whims of Middle-Ages authors. God asserts in the Quran that it contains Clear Verses that elaborate one another: "Whatever argument they come to you with, We provide you with the Truth, and a better exposition." (25:33); "...A Light from God has come to you, and a Clear Book. " (5:15). Even Ibn Katheer mentions in his writings that the best 'interpretations' are those depending on Quranic verses shedding light on one another. The terms (explanation) or (interpretation) are insulting the Quran (and consequently its Author: God) as if it were vague or convoluted, or even filled with logarithms and hard ideas; this contradicts the repeated idea in the Quranic Chapter 54 that the Quran is made easy to understand. Is it logical that a concise, clear book like the Quran would need countless 1000+ page books to 'explain' and 'interpret' it?! Let us asset the following remarks. 1- A researcher must define and locate repeated sets of Quranic terminology, as is the case when tackling any other book within any research; the Quran contains no referrals to outside sources that might help to understand it; thus, we are to define its terms using ONLY Quranic verses as we study the one containing the same term and its derivatives. 2- Lexicons and dictionaries of Arabic are authored/complied centuries after the Quranic revelation; they cannot be used to understand the Arabic style of the Quran that emerged in the 7th century A.D. as the Arabic tongue changes within all levels, as is the case in all living tongues. For instance, the Arabic term (Ameed) in lexicons written during the Abbasid Era means (infatuated or sick with love), while in the 20th century modern Arabic, the same term means the dean of any faculty. The dean who attacked our views cannot deny this linguistic fact, we presume! 3- Hence, Quranic terminology differs a great deal from Arabic terms after and before the 7th century during Muhammad's lifetime. We cannot use outside sources to understand Quranic terms, then. for instance, the term Sunna in the Quran means God's method, sharia, or way, whereas Sunnites use the same term to denote their hadiths in which we disbelieve and they ascribe this term falsely to Muhammad. The Quranic term (Ummi) means (of [or related to] the Gentiles) and in the Abbasid-era Arabic and today's Arabic, the word (Ummi) means illiterate. The Quranic term (Haad) means God's law or right, whereas Sunnites made the term to mean penalty. Hence, lexicons and dictionaries of Arabic cannot be depended upon as sources to understand Quranic terms. 4- Likewise, heritage and traditions books (our specialty as a historian) cannot be used to understand the Quran. The reason: such books are filled with discrepancies and contradictions regarding all topics related to religion and history. For instance, regarding the topic of the literacy of Muhammad, the story of the first encounter of Gabriel with Muhammad as per history of Al-Tabari indicates that Gabriel gave Muhammad a parchment to read from it the Quranic verses (see History of Al-Tabari 2/300-301), and this story, if true, indicates that Muhammad knew how to read and to write. Even in the book of Al-Bokhary (part 3, page 91), we find a narrative about the dying Muhammad writing his will and testimony and he wrote the Quran in that order we see now. This means that Muhammad was a literate man. Other stories by other male authors show that Muhammad was an illiterate person! The biographer Ibn Hisham narrates about Muhammad two contradictory stories about a peace treaty: at one narrative, he mentioned that Muhammad wrote the treaty himself, and at another, he writes that Muhammad commanded Ali Ibn Abou Talib to write it! Such contradictions make us discard all heritage and traditional books as they are unreliable; we rely only on the Quran regarding all topics within Islam; God says in the Quran: "...And who speaks more truly than God?" (4:87). Naturally, in such cases of endless contradictions and discrepancies, we are to rely SOLELY on the Quran as the Only One source of Islam and its history. This is our methodology and we hope to die and meet God as adopters of this methodology. As for the method of this former dean in his article, he quotes lexicons and heritage/traditions books as if they were infallible! In fact, he makes such books authored by men as controlling the Quranic terms, as if God did not provide verses that explain one another as per 3:7. Thus, when a traditional notion/definition contradicts a Quranic verse, Sunnites like this former dean supports the meaning found in traditional books and he would readily reject the Quranic meaning! Shame on him! Why this former dean is rejecting innovative, unprecedented ideas?! Why does he stick to ancient books as if they were divine or holy?! How dare he mentions that ancient scholars unanimously agree on the myth that Muhammad was an illiterate person?! Unanimity among Sunnite authors is a myth; they never mentioned in their books any agreed-on notions at all regarding any topics! This is why the article of this former dean contain contradictory ideas and he dares to quote the Quranic verses we have quoted earlier to prove the literacy of Muhammad; he deliberately uses books of Middle-Ages authors to add opposing meanings to partially quoted Quranic verses that have totally different literal meanings. The verse 25:5 shows for sure that the disbelievers accused Muhammad of being dictated the Quranic verses by other mortals; this implies that they knew he could read and write. Yet, the former dean uses this verse to add his own meaning from books and lexicons of other authors, who disregarded this clear verse that indicates the literacy of Muhammad. The former dean insists that the verses we have quoted indicate recitation from his memory or his heart, not from written papers or parchments. As for the verse 29:48, it refers to the fact that Muhammad never wrote or read any divine revelation of former scriptures of the People of the Book before the Quran, and NOT that he never wrote or read anything because of his assumed illiteracy. Lastly, we have proven beyond doubt (using Quranic verses) that Muhammad was a literate person and that the Quranic term (Ummi Prophet) means the prophet of gentiles, as Muhammad was sent to all humankind in all eras not just to People of the Book (Jews + Christians). Thus, the term Quranic (Ummi) cannot denote illiteracy at all. Thus, Muhammad wrote the Quran in that order we see now before his death, within instructions of God conveyed by arch-angel Gabriel, NOT within random order by caliphs Abou Bakr or Othman and unknown scribes who allegedly wrote the Quranic verses within several parchments, as per Sunnite myths. Of course, God undertakes the mission of preserving the Quranic text till the end of days for all humanity in all eras. We cast no doubts at all on the unique style of writing of the Quran. This former dean has chosen to cast doubt on the Quran like orientalists who undermine it; he and ourselves have chosen certain opposite ways. We remind him of God's verses here addressed to Muhammad regarding the Quran: "Do not wag your tongue with it, to hurry on with it. Upon Us is its collection and its recitation. Then, when We have recited it, follow its recitation. Then upon Us is its explanation." (75:16-19).). Our article of response ends here, and we remind readers of it after about 10 years from its first appearance in 1996 to assert two undeniable facts: (A) religious thought of Sunnite extremists is confined to ancient Middle-Ages imams with mummified notions and views without any new ideas at all or any innovative, creative thinking, and this leads them to adopt views of these 'infallible' deities who undermine the Quran with their heretic views insulting to God and to Muhammad, and (B) sadly, some copies of the Quran in cyberspace are written in a different style and modern spelling; this is a grave error as it makes numerical miracles of letters of Quranic words lost; we must preserve the unique style of writing of the Quranic text as it contains secrets unknown yet by all people. to change its spelling to modern Arabic one is a crime by haters of the Quran, who imitate its Middle-Ages haters among Sunnite imams. May God guide all of us to His Path.